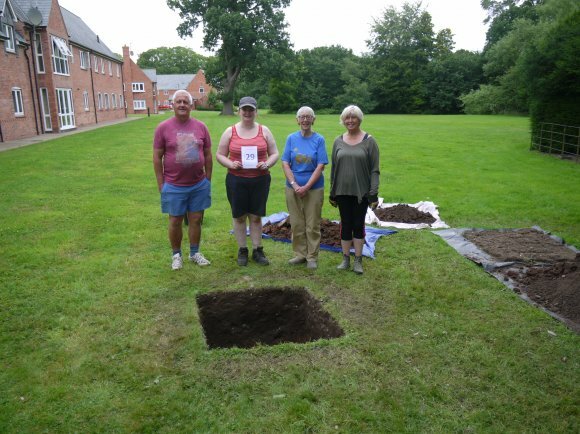 Three villages in the county were chosen by the University of Leicester Archaeological Services (ULAS) for a 'Big Dig' and Rothley was one of them. It was to take place on the 23rd/24th July 2016 so planning commenced at a meeting on the 16th May 2016 headed by Julie Attard from ULAS. This is a professional event organised by Leicester University and Charnwood Roots. Insurance cover fully covers all events and arranged by Leicester University for the whole of the events taking place in Leicester Archaeology Fortnight. The Lead Archaeologist is Matthew Morris who found Richard lll and supported by Field Archaeologists Andy Higham and Maria Gonzales. There will be at least one experienced archaeologist at each pit. The 'Incident Room' to be set up at the Village Hall, Fowke Street where all the finds are cleaned, recorded and organised. Volunteers will be needed for this part of the work. All volunteers will be briefed before the start and will then get together at the end of the weekend for the update. The early Saturday briefing will be in the Parish Church. Sunday evening will most likely at the Rothley Centre. There will be no cost to volunteers as everything organised and funded by the project. There will be displays in the village hall about local history with local publications for sale. 40 test pits needed initially out of which 30 would be dug. This allows for drop-out when owners find they are away at short notice. All equipment provided by Leicester University. All test pits will be covered in the evening for safety, not just for humans but also wildlife. Every test pit will be subject to rules including health and safety. All volunteers have to sign an Agreement. There are rules on digging and re-instating the pit to its former state. Test pits will be marked out 2 days prior to the dig and in agreement with the owner. For security, the volunteers will be identified by a badge to ensure that private sites are attended by authorised persons. There will be sites on council land for those wishing to observe. 150 volunteers will be needed so a lot of involvement from the village and getting people together will be good for the community. BBC Radio Leicester will be attending and the police will be in on duty.